Hi everyone! 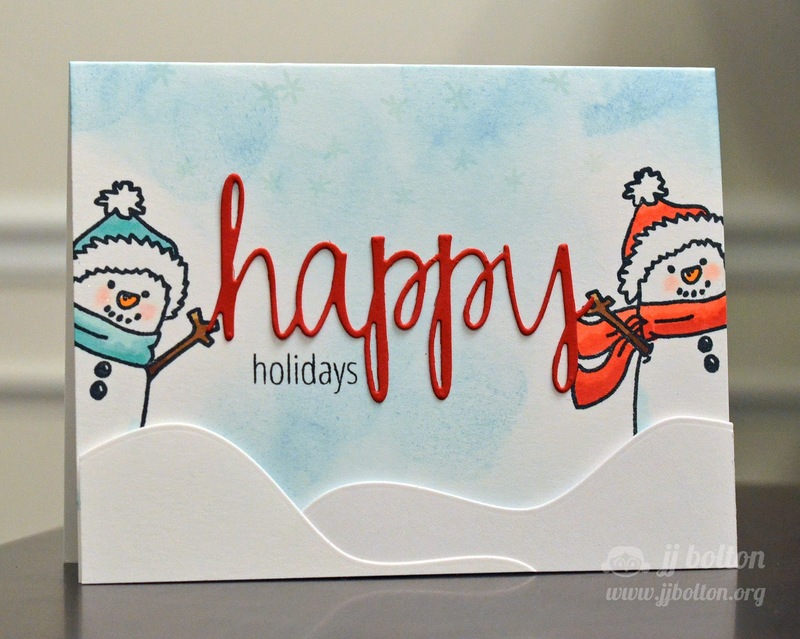 I've got a fun Christmas card that I made with the Avery Elle stamp set, Be Jolly! So easy to make together with a die cut and sentiment (using the Happy die and coordinating stamp set). The Mr. & Mrs. Snowman are colored with some copics and a little bit of glitter (Spica glitter pen). The rolling snow drifts were made using the wavy die in the Custom Panels set. Adorable. I may have to steal, uh, CASE this one!!! Oh my, this is just way too cute. Like how they are so colorful and holding the "happy." I own the Custom Panels. I need to remember to use them for snow drifts. How cute...this card is so sweet and l love how they are holding the happy die cut. So cute! I love those two little snowmen! What a great scene! Absolutely adorable. Very clever design JJ! I love that die and stamp set...such a fun card. So cute! Yikes...I have really gotten behind! This is absolutely adorable, JJ! Such a clever way to pair your stamps and dies!